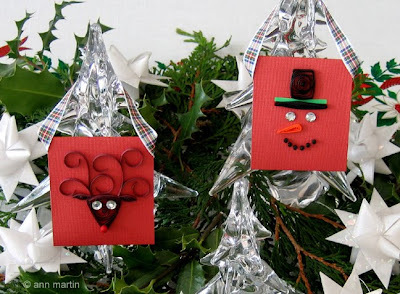 Last Christmas I hung this pair of quilled envelopes on the tree for our little nephews to spy. Since there's no shortage of wrapped packages for the boys to open (doting grandparents, you know) it seemed like a good idea to give them something to spend later on. And believe it or not, they slowed their frantic unwrapping for a moment to look them over. I'm pretty sure it was the big, shiny eyes that grabbed their attention, but hey, perhaps they noticed the quilling too. The reindeer was a CardMaker Magazine design by Alli Bartkowski (Quilled Creations) and I had spotted a roll of Christmas gift wrap with cute graphics that led to the snowman. I'm happy to say my non-crafty, but thoughtful sister-in-law put the envelopes aside instead of tossing them out with the rest of the wrappings and bows. Perhaps she wonders why I spend my time on such foolishness, but that's okay. I'm sure all of you maker-folks understand. This is such an incredible blog and totally puts my quilling to shame! Amelia, thank you for the compliment, but don't even think that about your quilling! Your flower is lovely and you obviously have potential as a quiller. It's not something anyone can do perfectly right from the get-go... it takes practice. Priscilla, thank you for finding me - I'm so glad you enjoyed my tv quilling segment. How very nice to hear you were inspired to give it a try! Come by again this Wednesday when I'll be posting instructions for the poinsettia card, as well as a video of the show. I have never done quilling before, I see it's a lot similar to rolling paper beads. I will have to try my hand at it. I can imagine it with paper beads, will to come up with earrings or something with it.